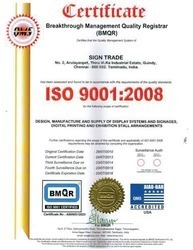 We, Sign Trade, Chennai, established our operations in the year 2000, as one of the grand ISO 9001:2008 certified manufacturers, suppliers and service providers of an immersed range of Advertisement Products. Our product selection comprises of Adventure Outdoor Tent, Banner Stand and Non Retractable Banner Stand that can be acquired in different designs, sizes, shapes and finishing for meeting the diversified requirements of our valuable customers. Owing to the eye-catchy designs and remarkable visibility, our products are vastly admired in electronic companies, MNCs, educational institutes, departmental stores and garment manufacturing companies. We are backed by a world-class workspace, which is set up with a varied range of advance & modern technology based machines and tools that help us in catering to the varied requirements of our customers. Furthermore, we have recruited a team of professionals, who are experienced in their respective fields and try extremely hard to fulfill the numerous clients’ demands. Since our inception, we have followed the strategy of proffering a perfect blend of quality and price to our esteemed customers. We are based on the grounds of moral values and engage in ethical dealings only. Our clients include Asian Paints, Bharat Overseas Bank Ltd., Brakes India Ltd., Cook and The Dhanlakshmi Bank Ltd.
We have earned an unmatched reputation in the industry, under the incomparable leadership of Mr. R. Mohan. Constant guidance and magnificent industry experience of our mentor have helped at all stages to inspire us to put in our best and attain the organizational goals. The amalgamation of our state-of-the-art production unit and team of professionals facilitates us to produce qualitative advertising products. Through our years of experience and extensive research and development we bring out the best quality products that command enormous appreciation from our clients and provide them values for their money. We have a pool of quality auditors whose job is to check the quality of the products from the initial stage of procuring raw material to the final stage where the product is packed for delivery. At our infrastructure, we have set up all the machines and tools based on the modern technology, which helps us in catering to the diversified requirements of our customers. All the operations and the systems are monitored by our staff members, who also carry out multiple up gradations and changes on the systems, when required. Our infrastructure has always played a vital role in the attainment of organizational goals and attainment of client satisfaction. In order to provide total customer satisfaction we offer a range of services to our clients. In depth survey of the global market is conducted prior to introducing any new service. Catering to corporate needs we offer Ad campaigns, annual reports, leaflets and many more. We also design Buntings, danglers, labels, stickers etc. For outdoor promotion we offer glow signs, publicity vans, digital printing and many more. During exhibitions we install arches, copy panels, pavilions and stalls. We also offer digital media services such as CD ROM brochures, corporate presentations, multimedia presentations and many more. We take immense pride in introducing our team of experts which is the backbone of our company. Our talented craftsmen and designers possess strong industry experience in their respective fields. They understand the dynamics of advertisement industry and create effective advertisement that comprise of beautiful colour combinations with excellent visual appeal. Our team of marketing and sales professionals helps us in further expanding our business and informs our clients about our products. They conduct rigorous survey in the market and work in close co-ordination with the production experts so that our clients get the best products. At Sign Trade, Chennai, we have recruited a team of experienced and skilled professionals on the grounds of their years of industry experience, technical knowledge and educational qualification. Our professionals are well-trained and work in co-ordination with each other so as to fulfill the numerous requirements of our customers, within the promised time frame. At regular intervals, we conduct multiple training sessions and seminars as well. We have earned an unmatched reputation in the industry, with our consistent efforts and hard work. Our precious customers have huge trust & confidence in our abilities and we deliver the best possible. We are quite famous in the industry for our outstanding range and its economical rates. Sign Trade, Chennai, is one of the preferred choices in the industry and aims to remain the same, in future as well. We have earned a vast number of clients, in the past years of our service. Our esteemed customers place immense trust in our capabilities and depend upon us for the attainment of their different requirements. We believe in creating a relationship with our clients and this is the reason that we strive hard to deliver flawless products. Quality of our products range is never compromised at any stage and in the future, we wish to continue with the same strategy.